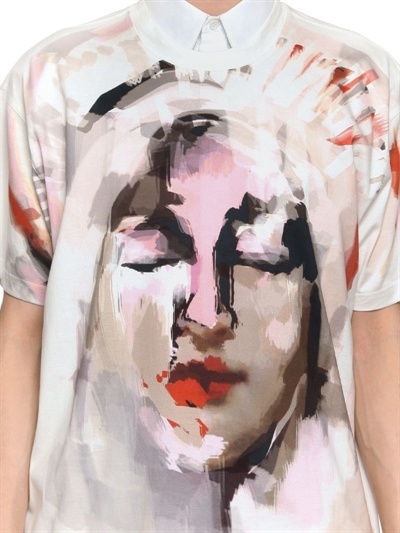 Capping off my Givenchy lust for SS2013 pieces would be another feature on the Abstract Madonna Print. We had an event a few weeks back at work and for the first day, I wanted to make a splash. 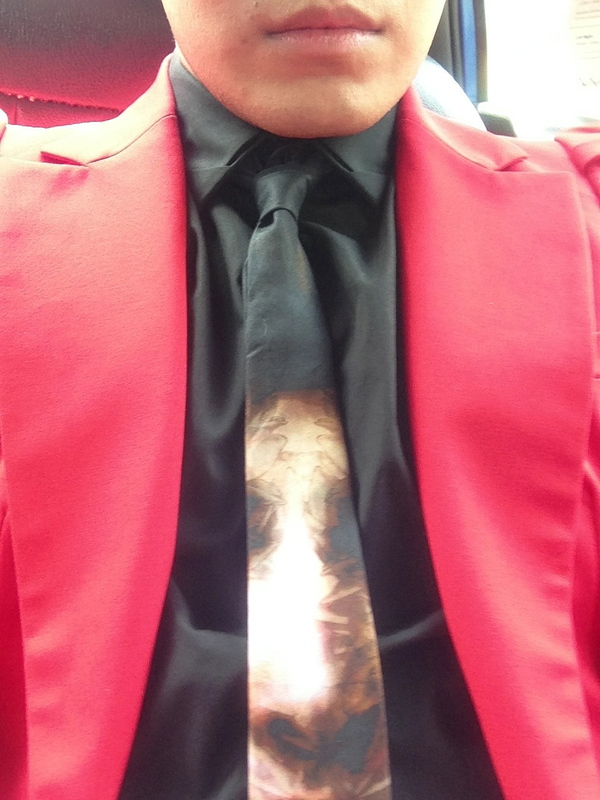 And a splash I did make - one in a blinding bright red pantsuit ensemble. Retailing for around USD 190 from Ssense, I honestly think this is a fashion steal. 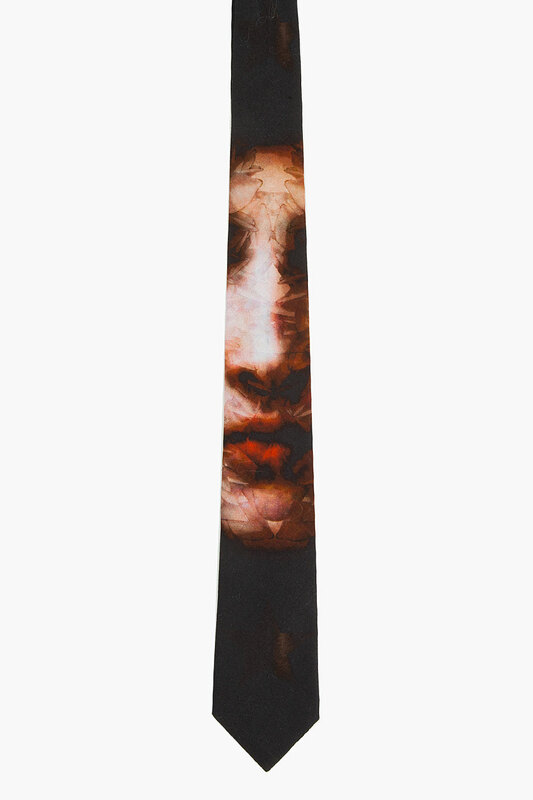 What more, it makes for a perfect statement tie, which every dashing fashion conscious gent should have in their wardrobe anyhow. While I was doing one of my window shopping rounds, spotted this gorgeous neoprene long vest with a hood from Givenchy. Though it's a piece that's relatively warm for Singapore weather, I thought it could definitely add instant street cred to any casual outfit - definitely did that for what I was wearing that day. It's honestly a perfect winter to spring piece in places where the weather permits - dare I say perfect for New York. To top the look off, I paired it with this printed satin and leather sneakers that are to die for. It had the right amount of attitude to make this look rock! The vest retails for about SGD 2600 here in Singapore while the sneakers would retail for around USD 600 on Net-a-Porter[CLICK HERE to PURCHASE]. It seems like we're at a crossroads dearest fasioneistas. Rumors have been rampant. Fasioneistas have been frantic. The final vestiges of iconic Yves Saint Laurent pieces, which we thought would be kept intact by new designer Hedi Slimane, are about to bid adieu. Taking a break from catching the #NYFW shows, I just wanted to share a recent find during one of my shopping trips. Céline has recently launched a new clutch bag - perfect for evenings out or even for work if I can say so myself - called the Double Flap Clutch. 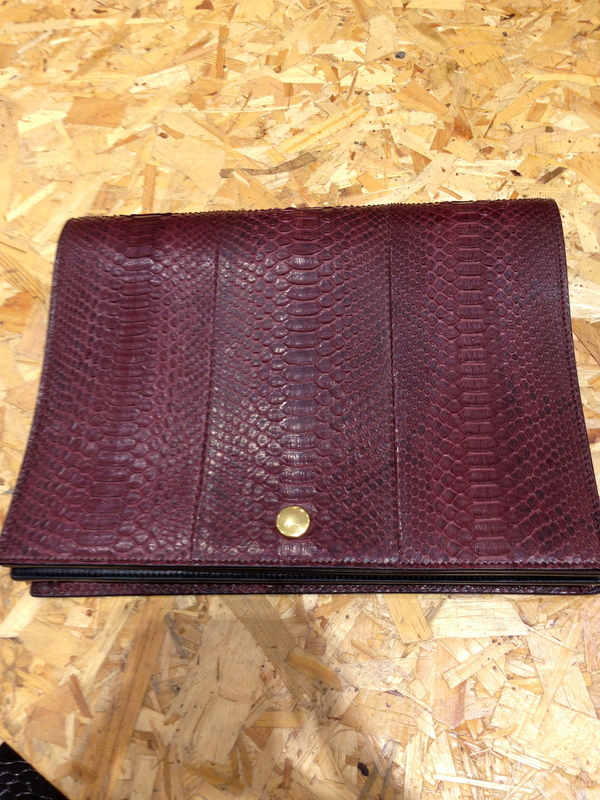 Available in the Takashimaya Boutique here in Singapore, it's currently available in 2 variations - one in python skin leather in a deep and warm burgundy colour as you see above and the other in a bi-color/material combination dominated by lush pony hair on the front flap with a bright orange hue. I am personally in love with the latter option and for SGD 2100, it's a piece that'll definitely add a touch of glam and bam to your wardrobe. For those looking for a more classic and elegant variation then I'd suggest going for the one in python, which retails for SGD 2700. Inside, there's so much room to put in essentials - whether you use the first flap pocket to store say an iPad Mini or even evening out necessities. Alternatively you still have the zipped area to put other items you'll need. There are also a sufficient number of card and money slots for you to play with on the other flap side as you can see below. Gorgeous isn't it? I just love it and I'm thinking of getting one myself. So if you're lusting after these babies, better head on down to Takashimaya [look for Jasmine who'd be the perfect person to assist you] before they get all snatched up by fashion addicts such as myself. 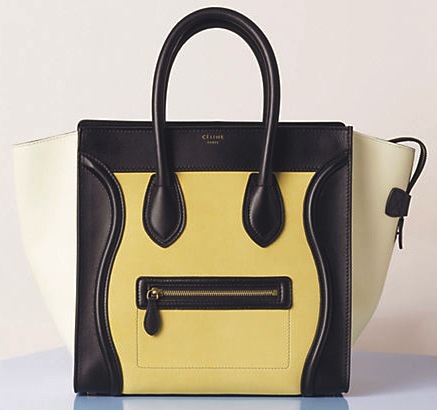 I've noticed that a lot of you have been clamoring for the latest Céline Luggage colors for SS2013. Most of the colors are now out in stores anyhow, but I thought it'd still be good to share what's [was] available. We all know how quick these babies fly off the shelves these days. It's like fasioneistas are prepping for the plague! This season, we'll see a good range of bright and dark hues for both the regular luggage tote and the phantom - orange, flesh, tan, butter, burgundy or rust, navy, slate blue and of course classic black. Just note that not all of these will be available to both designs. There's also a range of leather options to choose from - supple and natural. So sky's the limit! Apart from that, there's a series of bi-colored options available and here are some of my absolute faves. By the way, prices are increasing like cray cray for the Luggage so if you don't have one yet, better get one already before it reaches Chanel Flap pricing proportions! Happy shopping fasioneistas! Ah the allure of Spring-Summer beckons and it's almost time to update your wardrobes and bags with nothing but the latest & the greatest from the season. Well, look no further than Tisci's collection for SS2013 for mouth-watering pieces that are to die for! There are a couple of eye-catching designs this season and first up would be one of the more sought after new celebrity staple - the Lucrezia. A lot would probably say this is reminiscent of Vuitton's Speedy but personally I think it has it's own unique flair and character to it, making it the perfect workbag. Retailing for SGD 3350 in Singapore [or for USD 3175 via Bergdorfs] for the medium size, it's available in 2 variations [blue and brown or bronze and black] as you see above both in sturdy calf [or was it buffalo?] leather. Initially when you see the piece you may be put off by the scratchy nature of the leather, but honestly after some deep thinking it will definitely add character and personality to the bag as it ages. I also adore the 2 leather side straps that frames the bag and of course it has a utilitarian aspect to it in helping protect the integrity of the bag's structure. Alternatively, if you're looking for the perfect evening clutchfor the holiday season, there's the Obsedia Minauidere retailing for SGD 2650. It's the perfect stand out chic item - sure to draw the envy of ladies everywhere and grab the attention of gentlemen with its unique and edgy design. Don't even think about it if you're still lusting after any one of these pieces after reading this post. It's so worth it. Don't hesitate, just jump and grab these pieces! After all, it's the holidays - perfect excuse to buy a gift for one's self [or for someone else for that matter ;)]. Merry Christmas fasioneistas!